There is no such thing as a typical day for Creative Learning Assistant, Una McKeague. My first job after university was with the Nerve Centre in Derry/Londonderry as a Digital Communications Assistant. After my post ended I got a two month contract as an Exhibition Invigilator for Nerve Visual Gallery, where I assisted conceptual artist Anne Tallentire. After that I was out of work for about six months. 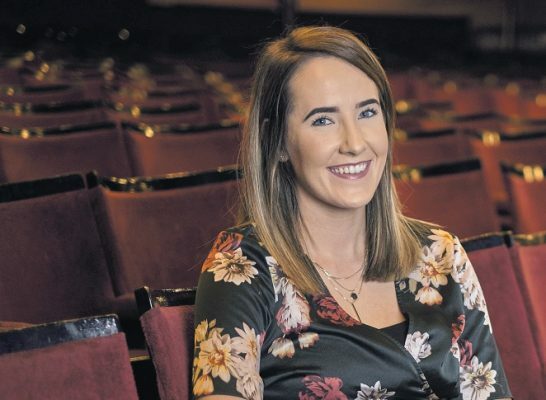 I then spotted the apprenticeship at the Grand Opera House, provided through through the Creative & Cultural Skills Northern Ireland Creative Employment Programme – I have been here nearly two years now. My job involves working on a huge number of projects including the big summer youth production and many educational outreach projects in schools and communities. I studied Arts and Festival Management at De Montfort University. Through my Community Arts Apprenticeship with the NI Creative Employment Programme I will gain a Level 3 Community Arts Management qualification, which I will finish this month. I love art and wanted to work in the arts sector. I had considered being an artist but I like combining creative skills with business. At university I learned how to manage projects and I loved it and knew that’s what I wanted to do. in school, my passion for the arts came out and helped me make a decision on the direction to go. I simply started Googling for courses and found the right one for me. My degree was really important as it gave me some practical experience. However, because this job is an apprenticeship, it was more about seeing my potential rather than having scores of experience. They were searching for someone who had the right drive and ability, plus a love of the arts. For many arts jobs, you need at least three years’ experience, which I simply didn’t have at the time, so the Creative Employment Programme was just ideal for me. Apprenticeships are an alternative route and I was lucky that I was able to get paid employment with an additional qualification included into the mix. You need to be really organised and a strong communicator. In my job I not only work with the whole team at the Grand Opera House but also with facilitators, community organisations and members of the public for the workshops and projects that we deliver. I never have a typical day! Generally I have days in the office where I am able to organise upcoming projects and plan for future events. Then we get to be out overseeing all of our projects so I could be anywhere in Northern Ireland. I love the summer youth production. It’s run over two weeks but the planning actually starts a year or more in advance. It’s amazing to see how talented the young people are and what they get out of taking part in this show. The biggest challenge is keeping on top of everything – you need to try and think ten steps ahead. The best part of my job is seeing the impact of what we do on people’s lives. Recently we had a project working with Belfast Harbour and four different communities in Belfast in which people told stories about their areas. Each group worked with a scriptwriter to put these together as a play and then the groups performed the show with four local actors. It was fantastic to be part of and had such a huge impact on the participants who took such pride in their areas. In speaking to some of them afterwards, they had a great time and a real sense of achievement that they had performed in front of an audience. Get experience! Volunteer as much as you can. I once managed a team of ‘zombies’ on a Zombie Run – it sounds random but it gave me experience managing a team in a busy setting. I’d probably try to be an artist. Breathe! On my first day my manager took me around the Opera House meeting everyone and I was so nervous. So I’d say, be more confident and believe in yourself. I love spending time with family and friends, getting out in the sunshine (when we have it) and going to concerts. Perseverance is the key. I had five interviews and loads of applications that were not successful in the six months before I got this amazing apprenticeship. Also, try to find organisations that will support you to get more experience. The team at Creative & Cultural Skills have been there for me the past two years to answer questions and cheer me on, and the support I’ve had from everyone at the Grand Opera House has been incredible.